"Irish Wolfhounds are such an addictive breed with their soulful eyes and knowing looks". Our hounds are our hobby, but there is nothing amateur about our approach. Standards are high, with emphasis on health, heart health, longevity and their emotional wellbeing. Having a keen eye is imperative, as we strive to improve the breed, and there is nothing more pleasurable than watching healthy balanced hounds exercise, their speed, alertness, and movement is a sight to behold. I am grateful for the ongoing help and support of many other long established reputable Irish Wolfhound breeders in the UK, without this mentoring I would not have been able to breed and have such lovely hounds. I would also like to thank Jürgen, who I came to know because the Oelmühle Kennel name was on the pedigree of my first Irish Wolfhound. These days we very rarely advertise our Wolfhounds puppies. Our litters arrive when our girls are ready, which means waiting for a series of heart test results, and for the girls to mature. We also heart match our matings, in an attempt to achieve the best possible heart health outcome. All our puppies are born in our home, and there they stay until their new owners arrive. Having the benefit of the complete home experience while growing up, we are constantly with them for the first three weeks of their life. Also, we feel is it paramount, that puppies regularly go outside not only to play and exercise but to house train them as much as we can. The most difficult thing about raising an Irish Wolfhound is keeping them safe from their exuberance. New owners find it difficult to understand that the right care is vital for the first year during the growing process. Conveying this message is particularly hard. You need to perfect the careful balance of nutrition and exercise to protect them. Follow these simple steps to avoid disasters, or at least try and keep them to a minimum! Do feed your puppy on a healthy balanced diet. We advise you feed Bonaforte’s Complete. As poor nutrition or over feeding can lead to problems. Do allow your puppy free exercise in a secure area preferably on grass every day. Although giant breed puppies have fragile bones and joints, they do require some exercise to build up muscle tone and stamina and so a run around on the lawn with their owner keeping an eye on them is important. Do provide a safe and secure place for the puppy to rest, away from other dogs or children. Don’t over exercise your puppy under any circumstances. Do not walk your Wolfhound puppy until six months old and then build up the walk gradually, initially only walking for 5 minutes. 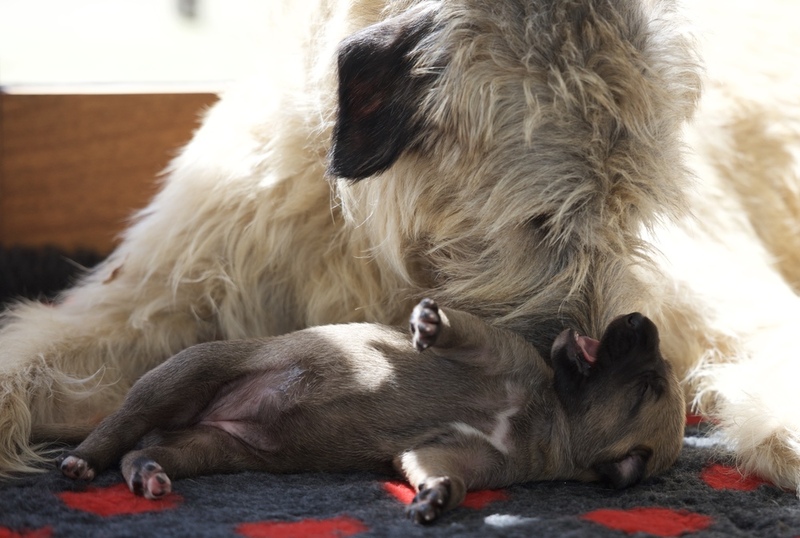 Despite their size, Wolfhound puppies are very delicate so treat their growing bones and joints with great care. Any mistakes in exercise and over exuberance under a year old can affect the puppy for the rest of its life. Don’t let your puppy walk on slippy surfaces such as tiles, laminate flooring, wood flooring or cushion flooring/lino. Slippy floors are responsible for an enormous amount of injuries in both puppies and older dogs of all breeds, but giant breed puppies are particularly susceptible to mishaps. They will slide on these slippy surfaces and hurt their legs and other parts of their body. Some of these injuries can have disastrous consequences. Don’t let your puppy play with other dogs (or children) unsupervised, even if they are your dogs and playing at home. Do not let aWolfhound puppy play with older/larger dogs until it is at least a year old. Again, letting your puppy run riot with other dogs is likely to end up with the puppy being hurt or injured. Don’t let your puppy walk up and down stairs, and prevent them from jumping out of cars. Keep impact on all joints to a minimum, even getting on and off sofa's in an exuberant manner may harm. Don't let puppy run over rough ground and fields. These areas can be fraught with potholes and hidden obstacles which may cause the puppy to stumble and tumble and hurt those long fragile limbs. 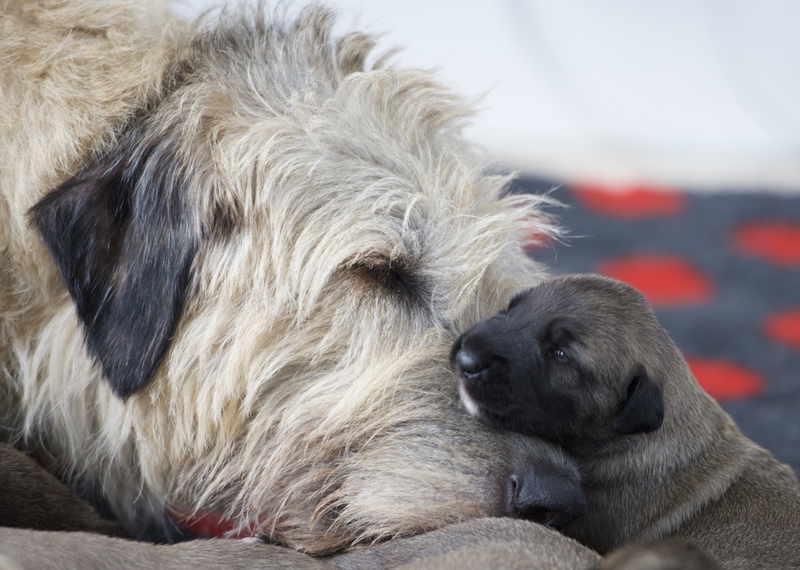 All our Irish Wolfhound pups are liver shunt tested, and to date have passed with low results. The shunt test certificate will be found in our puppy pack. All the hounds are heart tested every six months. Our puppies will be from parents who are heart tested regularly and cleared for breeding by a Veterinary Cardiologist. Copies of the heart test certificates for both parents are always included in the puppy pack. All our Irish Wolfhound puppies are vet checked: heart, lungs, mouth, eyes, rear hind flection test and general health check, in accordance with the Assured Breeder Scheme. The vaccination card is also included in your puppy pack along with results from the health check. Our puppies parents are heart tested every 6 months, parents are DNA tested and mating hounds are heart matched. Our Irish Wolfhound puppies are Kennel Club Registered. All puppies are sold with endorsements (see blog for more details on endorsements). All documents accompany your new puppy plus a supply of My Beloved Wolfhound Salmon & Potato kibble. We also offer a free heart testing service once your hound reaches the age of 24 months. It is very important for the Kennel and the breed that we keep track of the future heart health of our puppies. In addition, we make a donation with every puppy sale to further Irish Wolfhound Heart research. Most importantly of all, our puppies are born and raised in a home environment. Socialisation and handling play a large and important part of our rearing techniques, giving our puppies the best possible foundation we can, and we take time off from our work to ensure this happens. Our puppies are used to the vacuum cleaner, washing machine, dishwasher, TV and radio, the general clatter and commotion of the home. We expose them to as many different sounds and experiences as possible, and keen to introduce them to as many floor surfaces as possible too. How much is an Irish Wolfhound Puppy? Starting at £2,000 to purchase and on average including insurance, an Irish Wolfhound will cost you anywhere between £65 and £100 per month to keep. In addition, they are certainly not the easiest breed to own; they are very sensitive creatures, so finding them the right environment for their needs is crucial. You will need to do your homework and listen to your breeder, please. 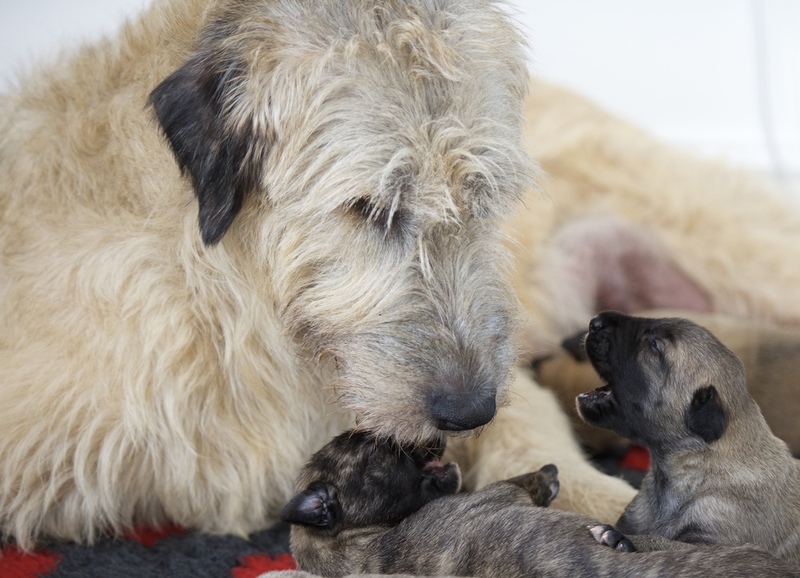 Despite their size, Irish Wolfhound puppies are very easy to injure when young and growing. They grow like weeds and their own exuberance can be their undoing, with their fragile gangly legs, too much bouncing around, carrying too much weight and playing with older dogs can cause untold damage, misery, and vets bills. Not everyone wants to take on a new puppy, as they do take a lot of time and energy. Some prefer to foster a more mature Wolfhound. If this is something that you would like to do, please contact me for more details. I am really sorry but I do not export puppies or adults. What is a liver shunt? Liver shunts cause serious and sometimes fatal outcomes in dogs. A liver shunt, or a portosystemic shunt, is a normal fetal blood vessel that in the womb bypasses liver tissue, allowing the mother’s system to filter out toxins for the developing puppy. In some animals, however, the shunt remains open after the animal is born, compromising its liver function, slowing growth, and eventually resulting in the death of many affected animals. Bile acids are produced in the liver and stored in the gallbladder between meals. They are released into the intestines to help break down and absorb fats and are reabsorbed and stored again until they are needed. Dogs with liver shunts have increased blood bile acid concentrations because the liver does not get a chance to remove and store these chemicals after they are reabsorbed. So please when buying your puppy ask to see his or her liver shunt certificate, and enquire if that certificate is included in your puppy pack because it should be. At no extra cost to the breeder either. Check the microchip number against your puppy’s number. This can be found in the centre column underneath the Idexx name. See Test Report for one of my puppies. It still happens that breeders don’t test, or say they have tested, and haven’t, for whatever reason. If breeding it is also inadvisable to use any dog which has had the liver shunt, so check that both parents tested clear too.